The following is an outline of the rates, important dates, & policies for the 2018/2019 school term. These rates & policies are supplied to you in a document that needs to be signed by a guardian before lessons can commence. Lessons are conducted on various mornings & evenings throughout the week at cpm-e's studio in SW Calgary. You can view our current availability to see if there is a time slot that might work out for your family. As a precautionary measure, parents of smaller children should stay with their child at least until they are inside the house. Parents are more than welcome to stay and wait for their children - there will be a spot to relax and watch some TV while the session is in progress. Did you know that you may be able to claim your child's math or piano sessions on your tax return? Speak with your accountant about this. CPM-E sends you a paid invoice each month for your records, as well as a annual statement sent out in January that outlines the fees you paid in the previous tax year. If you have any questions whatsoever, please don't hesitate to get in contact with us. Rates are billed on a monthly basis, at the first of the month for the upcoming month. Fees are automatically charged to your preferred credit card each month. All major credit cards are accepted. The fees to the left outline your monthly financial commiment for a weekly lesson. 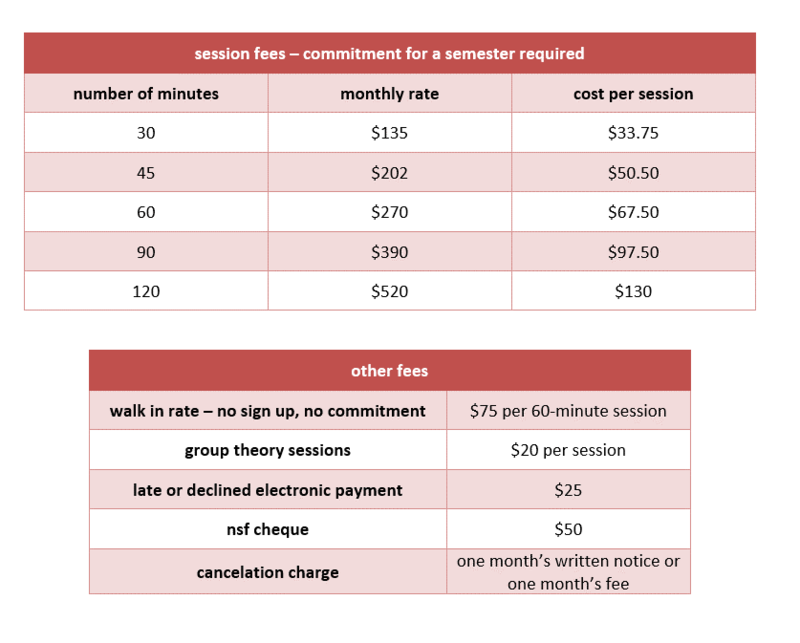 There is an average of 4 lessons per month throughout each semester. When you sign on, you are committing to stay either for a semester or a year. Should your circumstances change and you wish to terminate this contract prior the end of the semester/year, written notice of your desire must be provided to cpm-e one month prior to the termination date of sessions. If written notice is not provided within the said period of time, a termination service charge of one month’s regular fee will be charged to you. All charges remain in effect regardless of whether you come to the lesson or not. Money is not refunded for missed lessons, no matter what the reason. If for some reason cpm-e has the conflict and has to cancel a session, you will be refunded that charge at a prorated rate of one fourth of your monthly fee. We take two weeks off at Christmas and one week off for March break, as outlined by the traditional public calendar. Other than that, lessons are always on regardless of any holidays or school days off that may occur throughout the year. If a conflict comes up ahead of time that you are aware about, cpm-e can send out a "session swap" request to other students that week to see if anyone might want to switch with you. All conflicts must be resolved within 48 hour window of the original session time. If no one can switch, it will be counted as a missed lesson. The schedule during the last month of each semester (January & June) will be adjusted slightly to make sure each student gets their last four sessions in ahead of the date of their final exam.